I speculated back when Doug Meacham left TCU for a fairly unimpressive gig at Kansas that TCU was looking to change things up on offense once again. Obviously the switch to the Air Raid was very good for them and resulted in back to back 10-win seasons. But the big key was that the switch to the Air Raid was very good for unlocking the abilities of Josh Doctson and Trevone Boykin and the TCU offense of tomorrow is going to be hoping to make the most of some different players. I think the process and system will still be mostly Air Raid but I also think we’ll see some schematic shifts to make the most of some new talent arriving in Ft. Worth. This was a lower rated group for the Frogs but I rarely pay much attention to that as many of y’all are surmising by now. They actually signed eight of Eric Nahlin’s top 100 Texas HS players and secured 11 Texans overall along with four Louisianans and a few West Coast kids as well. Gary loves Louisiana as it’s basically the same turf as East Texas, filled with tons of really raw but athletic players waiting to be molded into savage defenders. TCU has always drawn an edge over the rest of the Big 12 for their ability to find raw and under recruited athletes, mix them into the TCU football culture, and then spit out physical and hard-nosed players on the other side. Their quest for another Big 12 title will depend on getting enough raw athletes for Gary to spin into defensive gold as well as finding more star offensive players that can match what Boykin and co achieved. It seemed for a while as though TCU was mostly targeting typical Leach-ian Air Raid QBs that could stand in the pocket and distribute the ball around the field but it’s clear that the impact of Boykin’s athleticism was not lost on the Frogs and they decided to make the securing of another dual-threat a priority. We’ve now seen multiple dual-threats in Air Raid offenses and the results are typically devastating. I feel uniquely qualified to talk about Shawn Robinson and not just because I’ve watched a lot of his highlights and broke down his championship game triumph over Cibolo Steele in the 6A D2 title game. But because some of the popular criticisms of him sound like they’re coming from people who are concerned that he’ll be the next Jerrod Heard. A dual-threat who’s limitations in the passing game hold him back from realizing his potential. Well I’ve watched Jerrod Heard very carefully and I don’t see the same kinds of issues. There are some obvious similarities. Like Heard, Robinson started at Denton Guyer and is absolutely dominant in the spread run game. When he came to DeSoto, they installed the normal assortment of QB run concepts and unleashed a monster who could physically dominate games, much like Heard. But there are differences as well. One is that Robinson left Guyer for DeSoto and led the perennially loaded (seriously, go count how many kids DeSoto puts in D1 football every year) Eagles to their FIRST ever state title. That’s remarkable and says something about his level of talent and leadership. Another difference is that Heard still isn’t close to 215 and Robinson played at that weight as a senior yet is every bit the explosive runner that Heard is, so you’re talking about a more powerful and durable inside runner. Then there’s the arm. Jerrod Head never had a very strong arm, he could lead a WR down the field and throw a comeback if he got the timing right but he has never been particularly accurate or powerful pushing the ball down the field. Meanwhile Shawn Robinson has top shelf arm strength and can throw some accurate lasers either from the pocket OR on the run (at least when rolling right). When Heard played at Texas they ran the ball very effectively with him but were done in by the fact that he couldn’t consistently hit the bubble screens and outside throws that allow a spread offense to effectively spread anyone out. Shawn Robinson is very capable and accurate making quick reads and throwing screens and perimeter passes, I don’t foresee anywhere near the same issues here. I know it’s not fun for a publication to identify a top QB talent only to see him lock things up to a small school like TCU and shut it down, but it is what it is. Shawn Robinson is an elite QB talent that is explosive as an inside runner, an outside runner, or pushing the ball out to the hash marks or down the field with his arm. Him and Sam Ehlinger are going to be by far the easiest guys to build elite offenses around in the 2017 crop of Big 12 QB signees. TCU locked him up early, perhaps based on the sell of OC/QB coach Sonny Cumbie’s success with Trevone Boykin, and I think they might have chosen other players in this class with the idea of building around his skill set. Or perhaps it’s just easy to project offensive players around Robinson because he’s such an elite talent. At any rate, the Frogs killed it here. The Frogs have been rolling with speedy backs that could hit home runs when teams vacated the box to defend the passing game and left creases open against TCU’s largely outside zone-based run game. Then there’s Kavontae Turpin, who sometimes serves in that role but also does some receiving out of the backfield and lines up out wide in the slot to wreak havoc matched up on linebackers. You could say the underlying philosophy is to find players that can bedevil linebackers from spread concepts in the middle of the field with quickness and punishing breakaway speed. TurpinTime part two? Or maybe #MachSnell? Snell ran a 10.46 in the 100m and might win the state title in that event this coming track season. He has absurd power and explosiveness in his quick churning little legs that makes him nasty in the run game and like Turpin he clearly knows how to use his speed to create opportunities in the passing game as well. His hands are good and he’s comfortable pulling the ball in against coverage. He’s not really a traditional RB but if you have a 215 pound running QB that can attack the interior gaps then you can afford to play more smaller, speedier players around him. 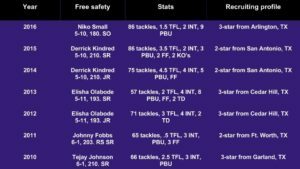 A real RB take might have been nice but last year’s take Darius Anderson looked very good in his freshman year and Sewo Olonilua is still listed here as well, to my surprise. #MachSnell could be a really special player. For the Frogs to take anyone here would be frankly kind of eyebrow raising. They like to get TEs on the field some for their run game packages but they normally put so little on these guys that I don’t see why they couldn’t lean on converted OL/DL or walk-ons for the position. They don’t go for the flex TE like other Air Raid teams, preferring to get more speed in the slot, and they haven’t really been a two-back run team much either save for some lead zone concepts. The Frogs went out of their way to get a JUCO that could help immediately in the blocking role and they got a pretty solid player to that end. Williams has good hands and decent speed but he lacks quickness to break open on underneath routes like you would want from a receiving TE, but he’s a really solid blocker including from an in-line alignment off a tackle which is valuable for the Frogs’ style of run game. Clearly TCU wants to be able to run the ball next year and they were willing to use a scholarship to bring in immediate help in the blocking game to do so. I think Williams is really solid for what they’re looking for but unlikely to be a particularly special player down the line. A worthy offer but he’s probably not going to have a big impact on this team. Like everyone else in the Big 12, TCU needs talent at WR to put real stress on opposing defenses with their spread sets. Unlike all of the other Air Raid teams in the league, TCU actually throws the ball to their outside receivers a lot whereas say Texas Tech’s slot WR in a given year is a near certainty to break 1k receiving yards. They need deep threat ability, like everyone else, but they also use their WRs a lot on ball control concepts like the whip/dig or curl/flat combinations. This kid’s Sparq results were not terribly impressive, a 4.83 40, 4.7 shuttle, 30.2″ vertical, and a 36′ power toss. His senior film didn’t make him look particularly explosive either, although he was playing on a broken foot, but it did make him look better than those testing results. Davis plays big and physical and was very fluid and effective at getting some separation in his routes. Evidently the Frogs like him inside in the slot and he could grow into a guy that’s not necessarily very easy to stop or tackle on third and six from that spot. Reagor was one of many elite WR prospects in this class for the Big 12 and he’s a bit unique from many of the rest. His Sparq results included a 4.41 40, 4.5 shuttle, 37.5″ vertical, and 33′ power toss. I think he’s an outside receiver that TCU will want to hit on the run whenever possible with shallow crosses, slants, tunnel screens, posts, and dig routes. He’s blazing fast and when he can turn upfield he’s gone in a flash. He reminds me of Sterling Shepard. I actually like Manning a little more than Reagor. His testing results: 4.66 40, 4.55 shuttle, 34.5″ vertical, and 38′ power toss speak of a guy who’s a lesser athlete than Reagor or some of the other top WRs in the state…but Manning is 6-2 and already 200 pounds. Also, he has brilliant hands and shows off some one-handed catches on his highlight film. Guys that run good routes with this kind of size and speed are really hard to cover or lock down for collegiate cornerbacks. I think the Frogs could put him outside and let him chew teams up with an assortment of normal deep/fade routes and then some of the curls, digs, and whatnot they like to use to attack out on the hash marks. The numbers here aren’t amazing unless we count #MachSnell who will probably spend some time here, perhaps even more then he spends in the backfield. However, the Frogs got two elite prospects that can play opposite each other and potentially make future TCU offenses a nightmare to contend with. Davis will also be interesting to watch, I think he has more football speed/power then you’d guess from his testing results. Here’s where I have a lot of questions for the Frogs, who have elevated the more run-game focused Cumbie to OC and hired Arizona State OL coach Chris Thomsen from a unit that was much more diverse in the run game than TCU has been of late. Additionally, unleashing the full gamut of Shawn Robinson QB run game possibilities would require mixing up the schemes up front and finding some different types of OL that can block power and counter. Can they adjust up front well enough to make the most of Robinson? Harris moved to DT as a senior to make room for Michigan OL commit Chuck Filiaga and he was dominant in that role. His power coming off the ball and working through blocks suggests a future as a mauling guard that is nasty coming downhill on inside zone or working with down angles on gap schemes. Harris should add some punch to the Frogs rushing attack whenever he’s ready to step in here. White plays with fantastic knee bend and was a true anchor in pass protection as a left tackle for his Washington high school. Even at only 6-3 I wouldn’t rule out him playing tackle in the future and evidently Gary Patterson didn’t want to rule it out either in his NSD presser. He’s flexible and athletic enough to also be intriguing at guard but they might split the difference and put him at right tackle. I mentioned Coy back in my “market inefficiencies in B12 recruiting” article a while back as a kid who’s film showed an undersized TE but who’s future was likely as a dominant OL after he grew in college. His older brother is the second best run blocker at Texas and a nearly certain starter in 2017 but Texas passed here for reasons I don’t understand. McMillon’s film is tremendous and features him showing well above average quickness and athleticism finding blocking targets on the move. Abilene moved him all over the place, caving in the edge as an in-line TE, pulling around from an H-back spot, and even leading from a more fullback type alignment. He was also a dominant DL. McMillon was basically always helping Abilene win at the point of attack on either side of the ball. Patterson mentioned he might play TE next year simply because he’s already such a brilliant blocker there now and then possibly move to center in the future. I’d like to see him at guard since I think he’ll be a brilliant puller but then that raises the question of whether TCU is going to start pulling OL more or if they’ll plug Robinson’s running ability into their current zone run game without adding too much schematic diversity. Either way, McMillon should be great. The numbers here aren’t great but I’m a big fan of all three of these guys and fully expect the hit rate to be very high here. However, TCU only took four OL in last year’s class so depth or hit rate have to become fairly concerning at some point. Evidently it was a priority for Patterson and the Frogs to get bigger on the DL after playing some 250-270 pound DTs last year. The Frogs’ run D wasn’t well rated last year and Gary has identified this area as part of the problem. Normally they like to get laterally quick, sturdy DTs that can slant, stunt, and be hard to get hands on. At DE they have a rich tradition of beefing up athletes and teaching them how to play on the edge. Their better teams are always very fundamentally strong on the line. I wasn’t blown away by Ellis as an athlete but he’s a big kid who’s highly adept at holding the point of attack and maintaining his leverage against blockers. If you’re just looking for guys that are a bit sturdier in the A-gaps then Ellis seems like he might have some real utility. Classic Gary Patterson signee, a two-star from a town barely anyone’s ever heard of who is going to make a position change after coming to school. In Louisiana Meeking played mostly WR and some CB but he’s very clearly a tall, lanky, and still growing athlete who’s going to end up much heavier after college S&C. It wouldn’t shock me if he was 250 before anyone knew it. His film shows a fluid and physical kid with long arms and solid hands, he’ll have a lot to learn to fit in at DE but he may have better raw tools for the position then many others joining the Big 12 in 2017. Again, Patterson’s ability to turn raw athletes into hard-nosed players is perhaps TCU’s greatest advantage in the Big 12. Bethley was a starter for one of the greatest defenses that Texas HS football has ever seen, the 2015 Katy Tigers. In their 3-4 defense he played as a strong side end that would at times set the edge and at other times man the B-gap. He grew and was better as a senior in 2016 but in 2015 they were more effective thanks in large part to the presence of OLB Jovanni Stewart and several other senior starters. At TCU he’ll be a DT for certain, although his ability to thrive in the box will depend on how well he learns to use his hands and feet in addition to his quickness to avoid direct confrontations with guards of the caliber that TCU are bringing in with this class. He’s some some real suddenness and will probably be effective on the blitz but I don’t know if he’ll be a real impact player or not from down to down. Collins played center for his school’s basketball team and he’s really smooth for a kid so thickly built. He might get heavy enough to move inside like Bethley, but he’s currently athletic enough to play on the edge. In fact, Collins even has some plays where he turns the corner on a tackle to get pressure off the corner. He’ll be an interesting one to watch, I suspect he may have the athleticism and build to eventually play on the edge at like 6-1, 270.
Cooper I’m a big fan of, he’s much faster off the ball then Bethley or Ellis and he plays with good pad level. He was a DE/DT in high school and he’ll be a 3-technique at TCU, probably eventually filling out to 280 or so. He won’t bring the same size up front that some of these other guys will but he’s a better athlete. For the most part I see this as a class that will help TCU hold down the fort up front and not a group that will necessarily have a lot of impact performers. However, I do think Tu’ua could provide some immediate help, Cooper and Collins are intriguing projects, and God only knows what Meeking will become. High floor unknown ceiling kind of group here. The normal pattern at TCU is to grab a LB every now and then but mostly to snag as many safety-sized athletes as possible and then find their linebackers from that group. At other times they’ll grab a LB but then beef him up and teach him how to play DE. Things are fluid in Ft Worth on defense, Patterson is always tinkering with the formula to try and clamp down on modern offenses. At any rate, they put such a priority on playing smart pattern-match coverage and flowing to the ball aggressively in their run fits that they often like smaller but faster guys at LB. Bush’s high school film had him playing mostly as a “sam” space-backer and killing teams with his lateral range in coverage and ability to blitz off the edge. He almost looked quick enough to play TCU’s “strong safety” position but you figured he’d probably grow into an ILB. Sure enough, he played mostly as a mike/heat-seeking missile at Cerritos College and was dominant. They played some 3-3-5 where he served in a Malik Jefferson-type role, moving around and blitzing the edge, inside, or dropping back as a traditional inside-backer. He’s a blur chasing the ball out of the tackle box but he’s at his best playing close to the action. His future at TCU will depend on a couple of factors, I think. If they want to keep mixing in lots of 30 front packages he might see immediate action due to his ability to blitz. They may also let him sit behind Travin Howard and Ty Summers for a year as depth and then grab a spot in 2018. Or they could redshirt him and get two full years with him…or put some extra weight on him and turn him into a DE. None of those outcomes would surprise me. Wallow was a safety in high school who also played down in the box a lot in a role similar to TCU’s strong safety position. You can spot him directing traffic for his teammates pretty often and playing with a lot of awareness for where the offense is trying to go with the ball in the passing game. Right now he has good speed and lateral range in coverage but it’s all too easy to foresee him as a 220-230 pound mike linebacker in their defense replacing Travin Howard in a few years. Both of these guys are perfect for what TCU wants to do at LB, which is to field rangy and versatile athletes that have upside at multiple spots. I very much expect that we’ll see both of them carve out roles in the future. TCU got into real trouble early last year when they were struggling at cornerback and couldn’t get away with their normal aggressiveness against the run. Things eventually settled down as Ranthony Texada rounded into form, Julius Lewis returned from injury, and safety Nick Orr helped lock things up on the back end. They always need to be finding really strong corner prospects because their scheme can ask so much of that position and it’s clear that Patterson finds a lot of utility in stockpiling safeties so it makes sense for them to make room for as many as possible. Onyemaobi’s best highlights are at WR but he’ll be a DB at TCU. He has fantastic acceleration in his first few steps which should help him close on the ball in coverage and his size and length are quite good as well. He has some nice clips playing press coverage in high school but I’m not sure if he has the hips and recovery speed or not to stick at corner in the Big 12. At any rate, he’s a good athlete that should be able to find a home somewhere in their secondary. When Daniels gets up to speed he covers ground effortlessly but he’s also good at putting a jam on a WR at the line of scrimmage and closing over short distances as well. I’m impressed they found a guy with this level of athleticism (probable 4.5/4.4 runner) at his size. Normally Gary has to load up on 5-10, 170 pound guys with some tenacity in order to get the level of play he needs at cornerback. I think Daniels may prove to be one of the more underrated guys in this whole class. He blew up late in the cycle with offers coming late from Missouri, Notre Dame, and Arizona State. He decommited from Baylor which should help endure him to Frog fans. Sometimes I’m really at a loss to understand the rankings of some of the players TCU tends to sign on defense. The best I can figure is that he was a grades risk who managed to put things together later in high school. At any rate, he has something like 4.6 speed and he flies around with malice on the football field. He could probably fit at any of TCU’s safety positions but he’ll probably play free or weak safety because he’s good at hawking the ball from a deep or robber alignment and he can cover ground very quickly and easily from a two-high shell. Van Zandt is probably one of the TCU fan’s favorite signees in this whole bunch. Gary Patterson thinks he’ll fill out to 220, regardless of the position he ends up playing on the field. I’m guessing that position will be one of their three safety positions, perhaps free safety since that’s where they like to put their best athlete and overall player. His film is entirely of him playing RB and he was totally dominant in that role with jump cuts and acceleration that completely blew away his competition. The KOs for Derrick Kindred are “knockouts” because he literally knocked two players out, both of which might have otherwise had a big impact on those games. His knockout of Daje Johnson cowed the Longhorns and set up a blowout win for the Frogs and his knockout of Oregon’s Vernon Adams was a crucial component in that magical, come from behind victory. Van Zandt might outgrow the position if he ends up at 220 like Patterson thinks he will but then there were times in 2015 when Kindred was the biggest guy in the defensive backfield (including the LBs) and they still kept him back there. Guys that have the athleticism to cover ground and break on the ball can pile up some stats from free safety but it obviously isn’t a spot that gets to mix it up as much as the weak or strong safety positions. Watching where Patterson feels that Van Zandt will best serve the TCU defense will be something really interesting to keep an eye on over the next several years even though most of our attention will inevitably be on Shawn Robinson and this offense. TCU got one really good corner prospect, two really good safety prospects, and then another guy that seems likely to fit their style well. You couldn’t really ask for a more talented group, especially considering TCU’s place in the pecking order recruiting Texas athletes, but they probably should have signed two more guys given their (and everyone else’s) tremendous need for multiple DBs. This is still one of, if not the, most feared defense in the Big 12 and Patterson has great respect from the offensive coaches across the Big 12. This class was pretty typical from TCU and while I’m not blown away by their athletes on the DL or their numbers on the back end, I’m not going to count out what Gary can do with this group. The offensive class on the other hand, this is a fascinating group. They’re going to be tempted to start retooling this offense around Shawn Robinson very quickly, especially if he takes well to Cumbie’s teaching like Boykin did, and if they can combine their normal passing game with a QB run game as versatile as what DeSoto used then they’re going to competing for Big 12 championships with this bunch. I like the Shepard comparison for Reagor except Reagor has more top end speed. Reagor. The Sooners missing on him and Duverny in consecutive classes stings. Marquise Brown oughta buy you a couple of years. Quazzel White is one of the few recruits I feel knowledgeable to speak on because he’s from my hometown and I made an effort to watch film of FBS prospects from there each year. White could end up at tackle, but I don’t think it will happen anytime soon. He appeared to be so physically dominant in most of his high school career that he has never really developed good footwork and punch in pass protection. He’s got the athleticism to do so of course, but its going to take a couple years. Overall, I really like the guy, but he’s got balance issues when moving backwards that caused me to unconsciously clench my fist when watching the tape. So for now, I’d say he’s a guard. But give him some time under Jarrett Anderson, and I’m optimistic he can play tackle in his junior and senior years. Frogs have their fingers (legs? toes? webs?) crossed on getting a certain OT transfer after this semester ends. By the way, noice work, Ian. Who is that? I’ll try and figure it out via my powers of Google but that is interesting. After searching the web for clues I’m going to guess that it’ll be someone who increases the number of California kids joining the program in 2017. Always enjoyed your writings back in the day of BC and The Recruitocosm. Best of luck with your ventures. Always felt recruiting classes should be graded on three criteria: fit, addressing needs, and upside. People laughed about Max Emfinger’s list, but one thing Max was right about (which is most likely the only thing Max was right about) is that some recruits will do better in one system versus another. Patterson’s strength has always been finding kids that fit his and the part that really gets overlooked in this class is the pedigree of success spread across this class, the manner in which they were coached in high school, and toughness. Think you might be off a bit on some of the grades. Agree on Robinson, the fact he got downgraded might be the biggest joke in recruiting rankings since the above mentioned Max Emfinger substantiated his expertise by claiming to be a scout for the Dallas Cowboys. I defy anyone to watch the laser Robinson threw for a touchdown at the end of the first half in the state title game and truly believe he is a three star athlete. Talked to coaches from two teams that faced him in the play-offs and the guy’s leadership is off the charts. He is Donovan McNabb 2.0. RB is an INC as Snell is a slot all the way which makes that group an A.
OL is a B or higher for upside. If McMillon really is 270 on tape as lean as he looks and he can gain weight kid has a huge upside. Cameron bite your lipe about o-line developing under Anderson, White has big upside as family is from Seattle and played at a very big program up there. There facilities and resources are crap compared to average Texas program which means White has yet to be part of a real S& C program. Don’t sleep on the many places Cumbie will use Williams. He is a Dan Sharp clone. D-line is a B- at least because the three d-tackles fill a need and Ellis reminds me of a young, raw d-tackle from Oklahoma named Davion. He isn’t Ed Oliver, but he doesn’t have to be for Gary. Just needs to hold two blockers and all three can do that. I am a bit concerned about LB though Meeking landing there is of interest. Secondary was a big home run with Daniels and Mike O as CB prospect. Again, Cal programs don’t have near the emphasis as Texas high schools so again the upside is huge on Mike. Seen Johnson for several years and if you play defense at Westfield you bring the damn wood. Stack this class on 2016, develop it, and it could be very interesting in a couple of years. That’s a good way to do it. I should probably weigh those more carefully when I make my grades. That’s basically what I’m doing just not very systematically. Surprised that you think Cumbie is going to be more run focused. What makes you think that? The fact that he signed Shawn Robinson plus some inside info. Interesting. Given how imbued Cumbie is with the air raid philosophy, I wonder if he’ll be able to make that sort of transition. I always felt that TCU’s run concepts were pretty simplistic. I can’t quite put my finger on it, but it seemed like TCU was using air raid 1.0 or 1.5 while other big 12 teams were using air raid 3.0. Huh, what makes you say that? Seems like Air Raid 1.5 was pretty devastating, at least when Boykin ran it. It was good, and I acknowledge that this is being somewhat picky, but according to S&P+ in 2015, TCU was 13th. Which is good of course, but other air raids were better: TTU (1), OU (7), Cal (10). And I’ll admit, last time I looked, before the S&P ratings were re-worked, TCU was ranked a little lower, outside of the top 20. And schematically speaking, it just looks simpler. They don’t seem to have incorporated as many RPO’s or two back sets and the run plays seem to be pretty straightforward zone plays. They didn’t seem to be as creative with using Boykin in the run game as other teams with dual threat qb’s either. I could be wrong about all of that, these are just casual observations. Some of that may be explainable by observing who was quarterbacking those various teams. For instance, they brought Boykin along slowly and much of what the Air Raid did for him was simplify things enough that his superior athleticism (and arm strength) was able to come to the forefront. The offenses you mentioned that are ranked higher include two NFL draft picks (Patrick Mahomes and Jared Goff) while OU’s QB Baker Mayfield has always thrived at executing read-heavy option attacks. Go read my new writeup on the two main styles of spread-option ball and consider where Boykin fits in that paradigm and where a guy like Mayfield fits. And of course, without Boykin and Doctson, TCU fell off the map all the way to 45th in S&P. Seems they didn’t really have much to fall back on in terms of innovative play calling to help mask some of Hill’s deficiencies.